Materials relating to the murder trial following the Pottawatomie Massacre in Franklin County, Kansas on May 24, 1856. 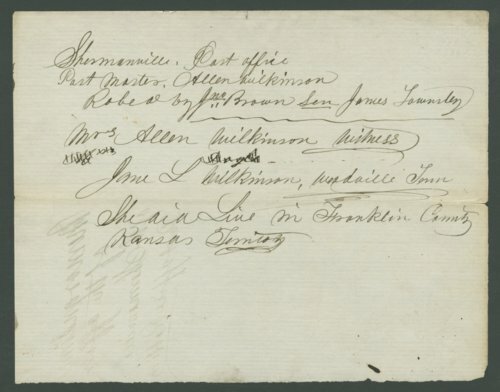 A memorandum charges that John Brown Sr. and James Townsley robbed the Shermanville post office, presumably in connection with Postmaster Allen Wilkinson's death during the massacre. Judge Sterling G. Cato ordered the arrest of John Brown Sr., Owen Brown, Frederick Brown, Salmon Brown, Oliver Brown, Henry Thompson, Theodore Weiner, and James Townsley for the murders of including Allen Wilkinson, William Sherman, James P. Doyle, William Doyle, and Drury Doyle. Two affidavits from George W. Grant and Joseph B. Higgins are also included. Kansas Territory, U.S. District Court versus John Brown Sr., Owen Brown, Frederick Brown, Salmon Brown, Oliver Brown, et al.